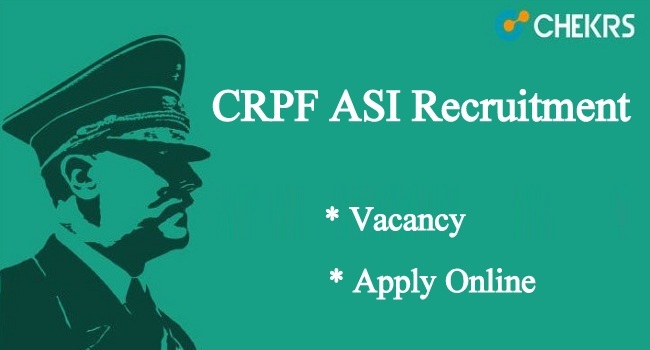 CRPF ASI Recruitment 2019: Central Reserve Police Force (CRPF) will be released a recruitment notification to fill various vacancies for the post of Sub Inspector, Assistant Sub Inspector, and Constable Posts. Interested and eligible candidates who are currently preparing to seek their career in Government Jobs can now apply for CRPF ASI Recruitment 2019 Application Form soon before the last date. Candidates must apply by filling CRPF Application form through its official website. In regards to more details of CRPF Assistant Sub Inspector Vacancy 2019 such as age limit, selection process, eligibility etc go through the article and get complete details. Recently it has announced CRPF SI Recruitment Notification 2019 for the post of SI/ASI/Constable vacancy. As per the notification, the candidates applying for CRPF Vacancy 2019 have to fulfill certain eligibility to apply for CRPF Constable Vacancy 2019 along with the other posts. ASI – Candidates must be 10th pass from a recognized board with three years diploma degree in Draughtsman Course. SI– Candidate must possess intermediate degree along with 3 Years Diploma degree from the recognized university of education. Constable– Candidate must be 10th pass from a recognized board. Save and take a printout of application form for future use. Central Reserve Police Force will be released CRPF ASI Recruitment 2019 for various job posts. To receive more updates on CRPF Constable Vacancy, keep visiting our site www.jobs.chekrs.com. In regards to any query or review, we welcome your valuable comments in the commenting section below and our team will revert you in a short while.